On 27th June 2014 the lower part of Paul’s body became paralysed due to complications induced by a tick bite. Yet, together with his wife Jeannine he manages to keep the business running in spite of his wheelchair confinement. Yet, he has had to shift the focus from the sale of venison towards the sale of premium breeding animals and trophy deer. 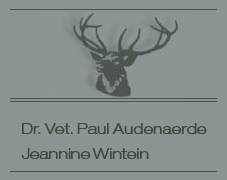 The Belgian Association of Deer farmers (ABEC) was founded in 1991 by Paul Audenaerde and the late Dutchman John van Beuningen. Paul was its President for 25 years. From 2000 to 2003 he was also Chairman of FEDFA, the European Confederation of Deer Farmers. This is how he became familiar with the impact of the European policy on agriculture in European member states and on deer farming in particular. Paul has written hundreds of articles with a veterinary, historical, mythological or corporatist impact (about anything deer-related for short) for the four-monthly edition of “Farm Deer”, ABEC’s magazine. Home and abroad, private individuals, deer farmers, media and public authorities have been contacting him frequently on deer-related issues. With the growing numbers of deer at the Marquettepolder farm, the acquisition of more farmland was required, deer being animals that cannot be bred in large numbers on relatively little land (Lapscheure, 7 ha). Through a fellow vet in France we were informed of a suitable farm for sale in his area (Journet, Vienne). That farm was bought in 1997 and that is how Le Bois Clairet, a former sheep farm, was transformed into a deer farm. Today Le Bois Clairet is a model farm in its sector. Meanwhile, tens of candidates have visited the place to learn about deer breeding or to prepare for the certificate of competence required for deer breeding in France. The combination of Paul’s veterinary activities specialising in deer along with his own deer farms resulted in a need to find the best technique for administering anaesthesia. Gaining experience with various systems, he was confronted with unreliable equipment on the market until he got acquainted with DanInject, Jørgen Jørgensen and Britta Mikkelsen’s Børkop firm, producers of dart guns. The exceptionally professional quality of DanInject products made him decide to accept their request to distribute their dart guns for Benelux, France and Spain. Naturally, his specialist veterinary knowledge has proved an asset to customers. Interestingly, DanInject has invariably been the brand used for immobilising animals in documentaries about African wildlife.